Architectural photography’s not really my thing – in more suitable hands I’m sure much could be done with the play of light and shade on the structure of the bridge itself. 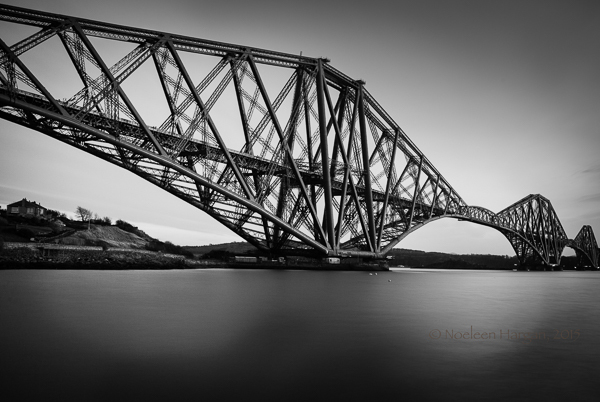 But Edinburgh’s Forth Rail Bridge is so eye-catching that’s it difficult to avoid trying a shot or two. Not calling it iconic – that is such an over-used word nowadays. This entry was posted on June 1, 2015 by Noeleen. It was filed under Architecture, Cityscape, Photography, Scotland and was tagged with bridges, Edinburgh, Forth Rail Bridge, winter.